Lane Electronics now offers a rugged RJ45 connector system, from Allied Connectors, created to fit those applications where completely reliable Ethernet communications are demanded in harsh environments. According to the company, the system meets the specifications of VG95234 and is a cost-effective solution compared to D38999 versions and more rugged than those produced to meet MIL-DTL-26482. The connector system is resistant to water ingress and vibration, secure and withstands ‘pulling’ on the cable in situations such as automation, process control and outdoor defence communications. 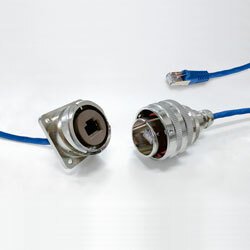 The connector system includes a panel mount receptacle and a male plug connector and protects to IP67 when mated. The system is intended to be used with shielded Cat6A cables and features internal grounding.